Thread a bead on to each end of the shoelace and knot to secure. 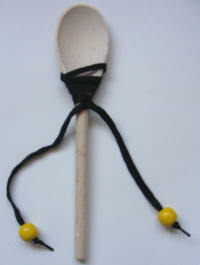 Wrap the shoelace around the spoon, gluing in place. Just a short length should be left either side. Glue an old CD or CD-Rom to either side of the spoon. You need very strong glue for this (we used a hot glue gun), so young children must be closely supervised. When the glue is dry, paint your drum with acrylic paints. Practise getting a regular rhythm going, or use your drum to support your favorite team at a sporting event - perfect for the Olympic Games in Beijing. 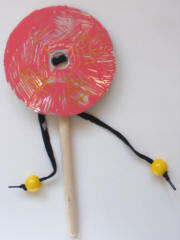 Or use your drum to make a loud noise on Chinese New Year!